Maintaining sufficient work and storage space is a constant concern for companies with high storage or floor space needs. When a business is outgrowing its space, moving to new premises is an option. However, the logistics of a move can be overwhelming. It usually involves delays, production closures, and high costs associated with relocating equipment and supplies. There is a simpler, more convenient, and far more cost-effective solution: installing a steel mezzanine system that utilizes vertical space in the existing building to maximize storage area and create a new workspace. A mezzanine creates additional floor space above the facility’s existing floor, making use of areas that were previously wasted. Industrial mezzanines are free-standing structures that can be dismantled and relocated as a company’s needs change. They are often used in warehouses, distribution centers, manufacturing facilities, processing plants, office buildings, and large retail stores to increase available area for storage, workspace, or office areas. A steel mezzanine is appropriate in a facility that has available space in an elevated area. Mezzanines can be built in a single level or as a multi-level structure, creating a second or even third floor. This alternative is an efficient and affordable way of maximizing usable space without increasing the footprint. Free-standing steel mezzanines consist of support columns that are positioned under a floor structure. The columns can be located to minimize the impact on your existing floor plan and operations. Mezzanine flooring is often made of steel mesh or steel plate, but other options are available such as wood. Equipment and work platforms allow facilities to place equipment up off the main floor. Safety railings, staircases, ladders, gates, lifting devices, conveyors, and walkways can all be added according to a client’s specific needs. Mezzanines are easily assembled on-site. Railings are an essential feature of mezzanine systems. If employees are working on an upper level, it must be designed to be safe and secure. Similarly, equipment and inventory stored on a mezzanine floor must be guarded so that it does not fall, preventing injuries as well as monetary losses. Heavy-duty railings should surround any mezzanine floor, including catwalks. They must be firmly attached to the floor, without unprotected openings that could lead to falls, and should incorporate handrails and other safety features. Handrails should be non-slip, with no sharp edges, and installed at an ergonomically correct height. Barrier rails should be heavy-duty steel and able to withstand impacts from forklifts and other equipment. They protect all kinds of equipment as well as inventory and modular offices. 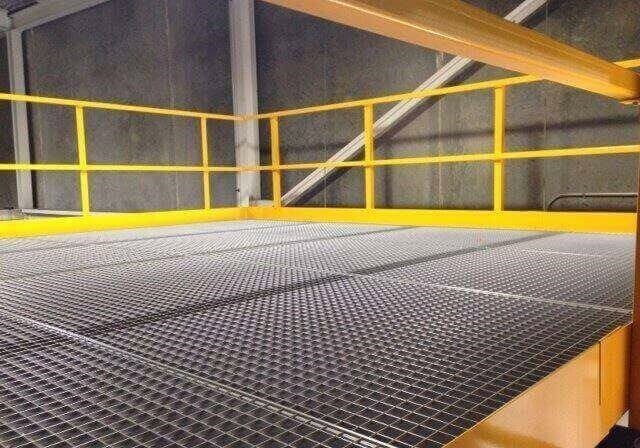 Mezzanine floors are used for a wide variety of purposes, including office and retail space, storage, and production. They can be arranged in all sorts of ways to suit the facility and operations. Floors can be installed in single or multiple tiers, as usable floor area or as aisles or catwalks that run between or around other storage systems. Mezzanines can be designed to meet specific headroom requirements, both above and below the mezzanine floor. There are several options for flooring, including steel mesh, steel panels, plywood, and bar grating. Mezzanine floors are typically installed in rectangular configurations, but the design is flexible and can change to accommodate specific floor plans or workflows. Staircases are added to mezzanine systems for access to upper levels, and also allow observation of the facility. The number and type of staircases will vary with the size of the mezzanine and its intended uses. Galvanized stairs can include steel handrails on both sides, open or closed risers, and non-slip surfaces for employee safety. There is a wide variety of staircase widths, stair angles, and step configurations. Ladders are another access option. The slope of ladders is typically steeper than the slope of a staircase, which is beneficial where floor space is tight. They are compact and offer easy installation. Some ladders are fixed in place, while others have wheels so that they can be used in multiple locations and moved out of the way when they’re not in use. We offer a large selection of gates to accompany our mezzanine systems. 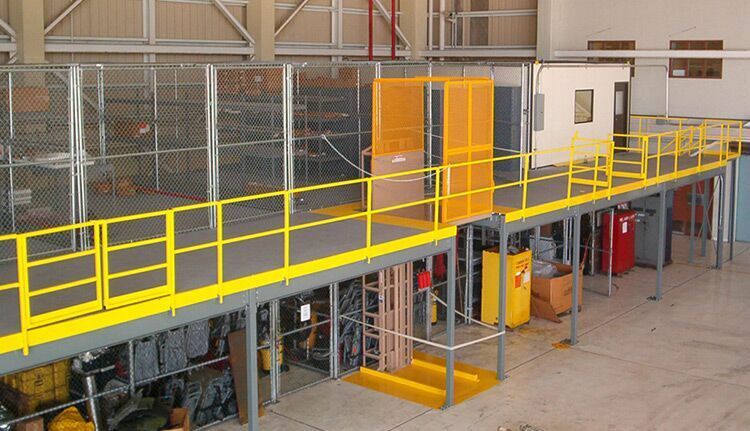 Gates increase safety for employees and assist in moving inventory and equipment on and off mezzanines. Depending on the mezzanine’s design, we can install single or double swing gates, sliding gates, lift-out gates, and safety pivot gates. All BSC mezzanines and accessories are strong and durable. They exceed OSHA, BOCA, and IBC codes with load ratings up to 300 PSF. The installation of a mezzanine can itself increase facility safety, as it leads to a reduction in clutter and disorganization, which are prime factors in employee accidents and equipment damage. Our creative team will collaborate with you to design a custom mezzanine system. We will accommodate your needs and workflow, and adapt to your facility’s size, layout, materials handling methods, span requirements, and load specifications, as well as intended functions. We will customize the width, height, span, materials, access points, safety features, and appearance of the mezzanine. 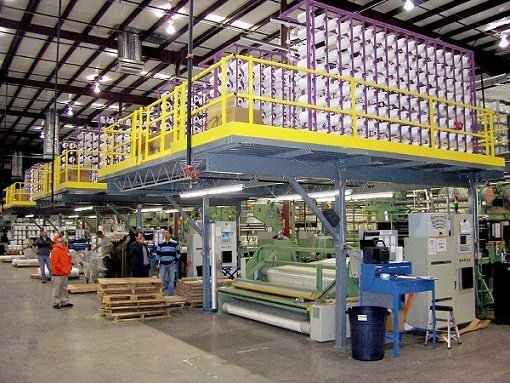 There are considerations specific to each intended use, such as production space, office space, and conveyor platforms. Those considerations may require the addition of specific features to the mezzanine design to achieve proper function and maximum safety. We will deliver a solution that suits your budget and can be adapted for your future needs. Mezzanines can be disassembled and modified as your requirements and processes change. BSC has been helping clients maximize their space and efficiency for 40 years. We love what we do, and our clients’ safety and profitability are always at the forefront. If you’re looking for options to achieve the best use of your facility’s floor space, give us a call to discuss a structural steel mezzanine as a possible solution. We want to help put your unused space to work for you.